Real men don't shave. Real men trim, twirl, and rub things like moustache wax or beard oil into their own-grown facial creations. But to confidently pull off a look that ninety per cent of men can't (or won't) — that alone more than off-sets the lost earnings potential. 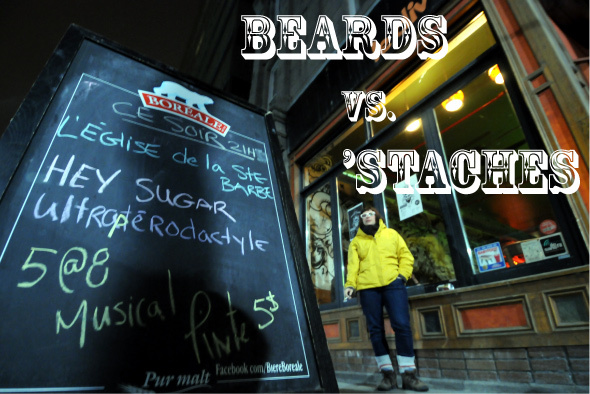 One such group of characters, rallying under the Montreal Facial Hair Club banner, gathered at Divan Orange last Thursday night for their first-ever beard and moustache competition, vying for a symbolic trinket and bragging rights in three different categories. Bands played in-between. Let us see how they did. 1. Gérard Depardieu, is that you? 6. Now that's a well-maintained face rug. Hi mates, how is everything, and what you would like to say about this post, in my view its truly amazing in favor of me. Black molds are known to bring serious health problems in human beings. bacteria. If the Liver is sluggish or slow then the toxins will remain circulating in the bloodstream. Wonderful website. Lots of usefful information here. I'm sending itt to some buddieds ans additionally sharing iin delicious. And certainly, than you to your sweat!